Marco has always been a great place for entertainment. The breathtaking sunsets, the beautiful beaches, countless restaurants, bars, and nightclubs all add to it’s entertaining nature. Recently, the island has seen a resurgence in live music and evening entertainment. Driving across the big bridge onto the island, it is easy to see the new and improved look and feel of Marco. Continuing on down Collier Blvd, it’s hard to miss the Esplanade, a gorgeous bayside complex with all the amenities: dockside dining, clothiers, ice cream shops and more. That brings us to one of the island’s newest places to enjoy live music, Mango’s Dockside Bistro. They have an exciting season of music planned for this year, including local and national acts. This weekend is going to be a serious treat for music lovers on the Island, with ex-Sheryl Crow guitarist, Todd Wolfe bringing his band to play a three night run at Mango’s. Thursday, February 28th, through Saturday, February 30th, from 7:00 to 10:00 PM. Here is a little pre-show-need-to-know about Todd Wolfe and his band. 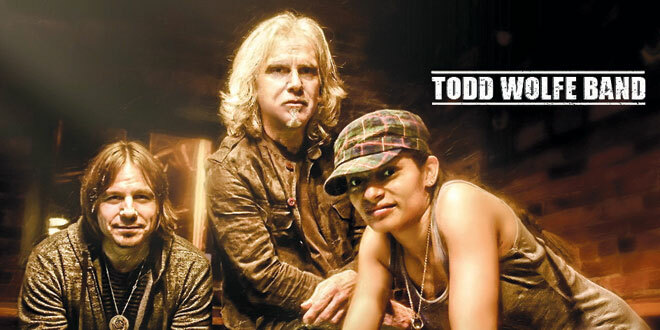 Wikipedia says, (and I know, I know, you can’t believe everything you read on the net) Todd Wolfe is an American blues-rock guitarist and singer-songwriter. During a professional career that has spanned three decades, Wolfe has had numerous album releases with his own band in the blues and rock genre. He has also worked as the lead guitarist for Carla Olson from 1991 to 1993 and for Sheryl Crow from 1993 to 1998. As a writer, Wolfe’s songs have been covered by Faith Hill, Stevie Nicks, Deborah Coleman, and others. Since departing Sheryl Crow’s band, Wolfe has been gaining popularity as a solo artist and guitarist in North America and Europe—especially in Germany—where he and his band have toured extensively since 2001. Judging from what I know about Todd & Co., and seeing them perform on youtube.com, I think this is going to be a great show to start the season with. Another act to see at Mango’s, is the The Lauren Mitchell Band, performing Wednesdays at 7:00 PM; Mixing blues, soul and a rockin’ performance for your listening pleasure. Thanks again to all the loyal “Music Noters” for making this so much fun to write, and reminding me why I do it. Also, thanks to the Coastal Breeze editors and staff, for letting me be a part of the BEST paper this side of the Caxambas Pass! ‘till next tweek….keep jammin’!